These affordable speakers perform admirably for their price, and also offer Bluetooth remote control via a free iOS app. Audio-Technica's AT2020 USB cardioid has been upgraded; how does it fare? Eschewing the ‘mix and match’ philosophy of most amp modellers, Brainworx have turned their attention to capturing entire recording chains. Managing mains power distribution in a project studio can be frustrating. Simple plug-boards are cheap and easy, but professional rackmounted mains distribution units (MDUs) allow neat centralised cabling. The latest addition to Eventide's stompbox range has the chameleon-like ability to emulate all of its siblings! Not only that, but the new H9 can be controlled and edited from your iPhone or iPad. Korg and littleBits have joined forces to make what's basically analogue Lego. What's not to like? Do these hand‑made, single‑driver speakers sound as good as they look? The latest generation of Mackie's VLZ mixer range incorporates their premium Onyx preamp design. Peluso's enviable reputation for building 'homages' to vintage mics looks set to continue with this tribute to Neumann's classic KM84. Rhythmic Robot continue to produce Kontakt instruments with a decidedly old‑school feel and tone, the latest described as a 'Source Variable Drum Synthesizer'. Roger Mayer has an impressive resumé, having built effects for Jimi Hendrix and Jimmy Page back in the day. As Roland revisit their classic Bassline, we ask does everybody need a TB3? 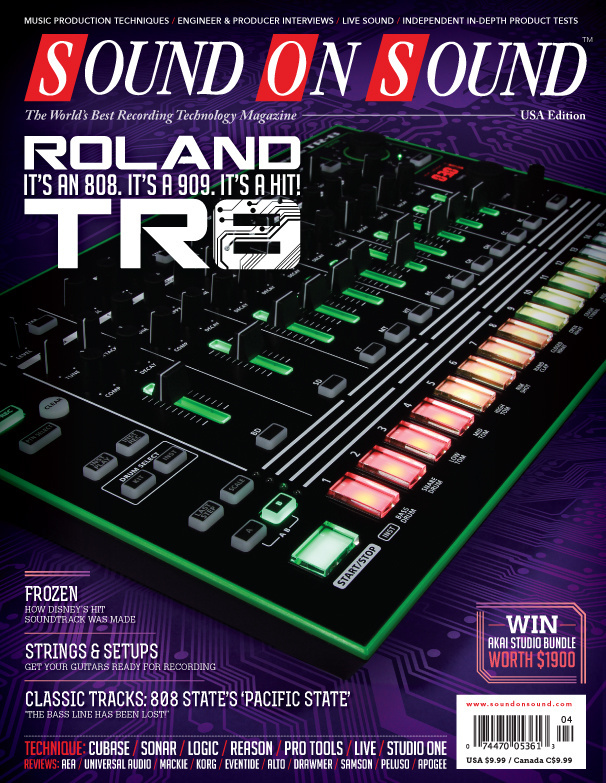 Roland's TR8 sees their classic TR808 and TR909 drum machines reincarnated in a single box. Is it what we've all been waiting for? There's no shortage of active monitors in this price range. Do Samson's latest Resolv series speakers have what it takes to stand out? If you want the sound of a top‑notch acoustic drum kit but don't have the drummer, kit and studio environment within which to record it, virtual drum instruments such as Toontrack's EZdrummer or Superior Drummer provide a cost-effective alternative. We look at ways to open up your Pro Tools plug‑in world through VST hosting. Join us as we delve into dynamics in Reason 7. Cubase offers several different ways to take advantage of your master keyboard's knobs, buttons and faders. The success of Disney's Frozen underlines the importance of music in film, whether it be as songs or soundtracks. Studio One MIDI sequences can incorporate any note division, no matter how bizarre! Half the battle in capturing a great electric guitar sound lies in understanding problems with the instrument itself — and solving them quickly. In part two of this series, we explore more simple ways to spice up your chord sequences. It's not often SOS readers get to mix a session tracked at Abbey Road — and when they did, the results were surprising! We look at the best apps for iPad mixing in Ableton Live. A Big String Sound On A Budget: this month, one of our engineers sets out to fake a big, lush, recorded string sound with only a handful of musicians. We visit a reader's studio in a converted garage to improve the acoustics, and to advise on mic selection and recording techniques for electric and acoustic guitar. This month's tracks from Miley Cyrus, One Republic, Black Sabbath and our Classic Mix - ZZ Top "Gimme All Your Lovin'' from 1983. Craft the perfect cover version in Sonar X3. Craig Anderton explains his approach to creating a perfect cover version. Be an architect of sound with Track Stacks in Logic Pro X.
Izzat Majeed single‑handedly resuscitated Pakistan's moribund music scene — and built a state‑of‑the‑art studio to capture the results. This month we review to music from Young Peculiar, The Situation, Vincent Pierce Smith & Karttikeya, Mark Barnwell and Christian Gregory. Did the iPad kill the dinosaur? SOS reader Paul Wavell discribes his journey through the history of Apple computers from the Lisa to iPad. If you've read up on what was shown at NAMM earlier this year, you might wonder where there is for the industry to go next. Read more about Where Now? From their gear choices to their recording techniques, everything about Wild Beasts' approach to production is unconventional. Q. How best can I clean up old cassette tape recordings? I have several cassette tapes of concerts and recitals recorded when I was at music college in the '70s, which I want to transfer to CD, cleaning up the recordings in the process. Read more about Q. How best can I clean up old cassette tape recordings? Read more about Q. Should I use high sample rates? Formal education has many benefits, but to become a successful engineer, you need more than a degree alone. There's a place for art in almost everything — even music for TV. The number of music grads is going up, but what of the number of experienced teachers? Few countries in the world can boast a musical heritage as rich as that of Cuba. Media content for the April 2014 issue.